The final days of August are enveloped in an atmosphere of quiet anticipation. It’s as if our town has come to a screeching halt and sits idling, waiting for the light to change, indicating the seasonal shift to fall. Perhaps this is a feeling shared with residents of other college towns, where still, humid air waits to be refreshed, electrified by the vibes of thousand of students returning to new classes and expectations. For me, this excitement is also product of my anticipation of the annual Ozone House fundraiser, An Evening at the Farmers Market, which will be held at the Kerrytown Farmers Market, Sept. 16, under the stars. I relish the long evening, clinging to the night when it’s still warm enough to dine outside. Ozone House is a shelter and support system for homeless and high-risk youth in our community who don’t have a safe place to call home. This year’s menu takes its cue from Michigan’s culinary landscape and from foods that may be found at the Farmers Market and in the shops of Kerrytown. As in past years, the main courses will be prepared by Kerrytown chefs and business owners, Mike Monahan and Bob Sparrow. Staff from Monahan’s Seafood will be preparing Grilled Great Lakes Whitefish with Michigan Tomato-Caper Relish, and staff from Sparrow Meats will serve London Broil with an Orange and Michigan Maple Syrup Glaze. The appetizers feature the exemplary products from Kerrytown-based Durham Tracklements & Smokery, which will be prepared by former Kerrytown chef Brendan McCall (A Knife’s work/Everyday Food) who is now executive chef at Mani Osteria & Bar. The appetizers served will include Melon with Smoked Salmon and Sun Gold Tomato Relish, Crostini with Whipped Ricotta, Olive Tapenade and Pickled Tomatoes. Chef Brendan will also create a Arugula & Mizuna Salad with Mushrooms, Crispy Shallots, and Parmigianno Reggiano for the meal. Side dishes served will be courtesy of Sparrow and Zingerman’s Deli, and Zingerman’s bread will be paired with Fustini’s olive oil. Dessert will be prepared, as in previous years, by Miyoko Honma of Cafe Japon. Beverages included are wine from Everyday Wines, beer from Arbor Brewing Co., and coffee and tea from Sweetwaters. I purchased Lake Superior whitefish fillets from Monahan’s Seafood in Kerrytown and quizzed Mike, the owner, about how he was planning to serve the fish at the event. Based on our conversation, I created a recipe, which is similar to the recipe in his most recent Fish Report blog. He encouraged me to savor the clean smell of the fish, to touch the flesh and admire the glistening firmness. I did just that, smelling and feeling the cool depths of the Great Lakes lingering on its silvery skin. The tomato-caper relish, which can be made 24 hours in advance, was splendid with the fillets, the synergy of the two capturing the essence of a Michigan summer. Mike tells me that when grilling white fish, it’s important your grill be clean and lightly oiled and that you cut the whitefish into manageable pieces, no larger than 5-6 inches each, for easy handling. I followed his advice, and my fish grilled beautifully. You could also grill it on a plank or bake or broil the fish with excellent results. You, too, can toast farewell to summer while local chefs regale you with this seasonal feast.The food for the tax-deductable, $100 dinner will be exceptional. I’ve attended the event since its inception, and the inspired and generous chefs — for the most part — remain the same. But if you’re interested, you’d best cut to the chase; the seats are selling fast, mostly from returning community and food-loving participants, such as myself. If one defines sustainability as the balance between self-renewing resources and supporting the common good of a community, not only are our food entrepreneurs creating sustainable menus by patronizing local farmers, our citizenry’s support of nonprofit organizations such as Ozone House, bolsters a sustainable community as well. Make a relish by combining diced tomato, vinegar, onion, herbs and capers. Reserve. Clean and oil grill grates. Preheat gas or charcoal grill to medium heat. Whisk together caper liquid and olive oil. 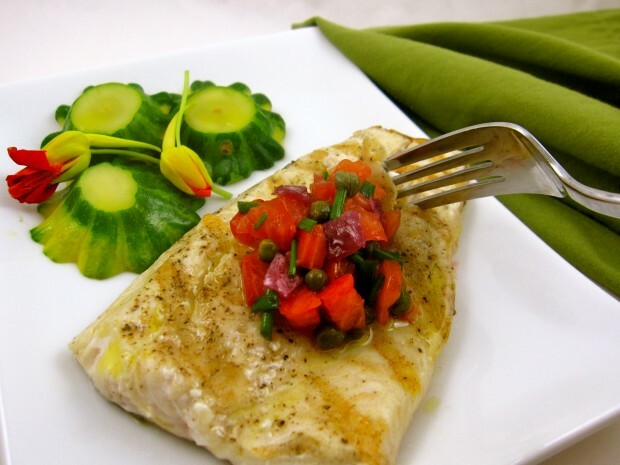 Place fish fillets on a sheet pan lined with foil and pour or brush caper-oil mixture over fillets. Lightly season fillets with kosher salt and freshly ground pepper. Place fish on grill, flesh side down. Cook, covered, 4-6 minutes. With a spatula, carefully flip fillets and continue cooking an additional 4-6 minutes or until flesh has just turned white. 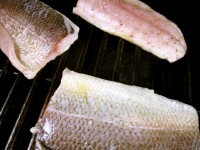 (Whitefish cooks quickly, will continue to cook after it’s removed from the grill, and you don’t want to overcook it; it will dry out and lose moisture and flavor.) Spoon a heaping tablespoon of the reserved tomato salsa over each fillet and serve.